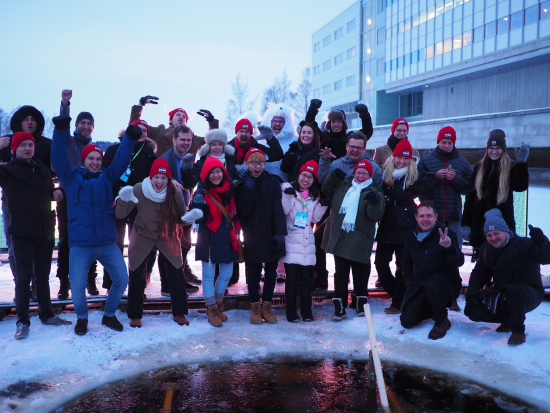 The semi-finals of Polar Bear Pitching started one and half hours late, because the ice hole where entrepreneurs were supposed to be pitching from, was frozen solid during the night. This is indeed the coldest Polar Bear Pitching in the history of the event, but it doesn’t stop these crazy entrepreneurs from piching from a frozen sea. Today 6 new companies earned their place in the pitching final. These start-ups are Mailando, ArtiSun, Edible, CONNAX, Cotio and Klever. Six more companies were selected to the final earlier. Heat Experience, Spark Horizon, Cast Print, Diske, Kipuwex and TuSion App will be competing with todays winners for the grand prize of 10 000 euros and loads of media and investor attention. Tomorrow Polar Bear Pitching will continue with the Day Conference, after which the finals will be held at Oulu Market square. With the startups, the air guitar world champion Markus ”Black Raven” Vainiopää and the ice hockey team of Oulu, Kärpät will take their dip in the frozen sea. Today’s minus 20 degrees was enough to freeze the ice hole even in between the pitches. This was either convenient or painful. One contester used the frozen ledge as a table for her papers and another told, that because he was standing still during his whose speech, the surface of the water started freezing and attached to his skin. Not only Finnish companies were brave or crazy enough to enter the ice hole. There were start-ups from 8 different countries, all the way from Vietnam and the United Arab Emirates. Some of the contestants in semi-finals even saw frozen sea for the first time today just before entering the ice hole. All the qualified competitors are in the picture with our Jbear next to the ice hole.